Reproductive toxicity is an emerging topic in Ecotoxicology aimed to evaluate adverse impact of environmental stressors to reproductive systems and processes. Sexual reproduction is the complex process that marks the creation of a new individual of the same species and is underlined by gamete activation and interaction. Gamete quality is therefore a critical factor in reproductive success and is defined as the capacity of a gamete to fertilize and be fertilized. In marine animals with external fertilization, gametes are released in the sea water and may be affected by a variety of stressors as xenobiotics, global warming and acidification. In order to monitor marine water health status, sperm toxicity tests appear to be of fundamental importance; in this line, several studies are addressed to evaluate physiological parameters of sperm quality as concentration, motility, morphology and viability. In marine animals impairment of sperm viability due to contaminated waters may affect fertilization capability, transmit damages to the offspring with a possible repercussion on development, fitness and even species survival. Fig. 1. In the left column the three marine invertebrates: the ascidian Ciona robusta (top); the sea urchin Paracentrotus lividus (middle); the mollusk Mytilus galloprovincialis (bottom). In the middle column live spermatozoa of the three species stained with SYBR-14 emitting green fluorescence. In the right column dead spermatozoa of the three species stained with propidium iodide emitting red fluorescence. Invertebrates are key species in the marine ecosystem, among them three species as the ascidian Ciona robusta (aka Ciona intestinalis sp.A), the sea urchin Paracentrotus lividus and the mollusk Mytilus galloprovincialis play an ecological role and are used as model for biomonitoring marine pollution. On these species, we have used a new approach for determining the viability of spermatozoa, based on a dual DNA fluorescent staining for living (SYBR-14) and degenerated (propidium iodide) cells (Fig. 1). So far the DNA staining method was associated with fluorescence microscopy or flow cytometry, two time consuming and expensive techniques. On the contrary we used spectrofluorimetric analysis and to our knowledge, no analyses were previously made combining the dual staining and fluorimetry. This approach resulted to us highly sensitive, simple, rapid and cost-effective providing an easy discrimination between live and dead spermatozoa. The utility of this new method fits with the increasing need to study the impact of environmental toxicity on reproductive mechanisms at either minimum cost and time and maximum sensitivity. Assessment of sperm viability is a very promising tool by which marine pollutants may be screened for spermiotoxicity in ecotoxicological studies. 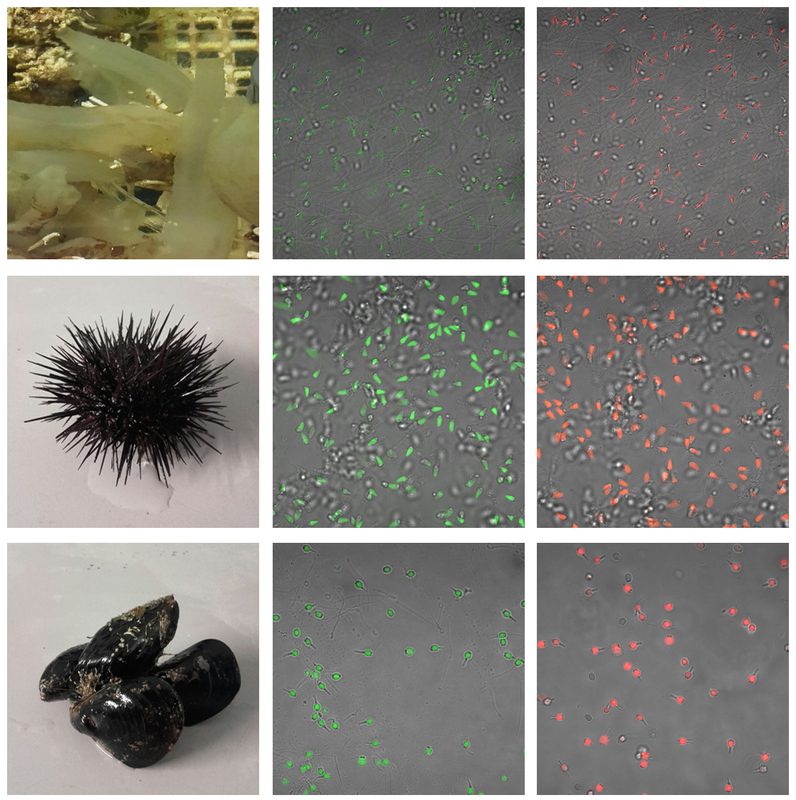 Sperm viability assessment in marine invertebrates by fluorescent staining and spectrofluorimetry: A promising tool for assessing marine pollution impact.